Pitch had ascended through the hole in the ground floor of Houndsditch that led to their cavern dwelling to make his way to one of the upstairs balconies. He stared out into the night, the moon reflected in his eyes like a pair of mirrors, as if two enemies would gaze upon each other forlornly, each trying to tempt the other. But Pitch would not budge, nor would the moon descend from space. Pitch was as silent as the night itself until he felt someone approach, stopping to stand next to him. The moment was broken, and he exhaled audibly. "The moon is quite a rare sight for me." The Queen stated, and Pitch noticed that all her tentacles were concealed. "The fingertips of its light cannot easily reach into the dark and dank places I am adapted to dwelling." She chuckled lightly. "I do suppose for that reason, I should regard instances like this as a privilege." She glanced over at Pitch then, silently observing his profile. "I also… believe that this time should also be a privilege to engaging in charming conversation." "Charming conversation is… not something I do quite often." Pitch replied, speaking for the first time. "Of course… all the more reason to consider it a privilege." The Queen shrugged, smirking lightly. "I should say the same for my own experience… even my loyal underlings are simply that… nothing more. Merely extensions of myself." Pitch scoffed. "I wonder why." The Queen furrowed a brow. "You think I am deserving of my solitude? Are you deserving of yours, then?" When Pitch didn't answer her, she took a step closer to him. "If we are to allocate all of this time in the same space and employment, we may as well become familiar with one another." "Ever heard of the phrase; 'familiarity breeds contempt?'" Pitch asked, glancing at her. "So you should not yet feel contempt for me at this point in the game." The Queen replied. Pitch stared at her warily. The Queen was certainly a complicated creature, and he didn't like when he encounter individuals that were hard to figure out. What truly lied under all the wriggling flesh and teeth like sharpened knives? It was almost comical that her form attempted some sort of normalcy by having a human like appearance, but he knew what rested just under the surface. "Why don't you try having a session or two with the good doctor then?" Pitch asked. "He certainly could use a… friend." The Queen smirked. "We already know a bit more about each other than we'd like. I would have called us enemies by indirect means in the past, but we both realized that what we loathe is the same, so there is no need for further quarreling." She leaned a bit closer. "But you, Pitch… you have a whole new set of enemies yourself that you've brought to the table. The doctor no longer piques my interest because I know all I need to of him. But you… you are like a dark maze… so much you hide in the recesses of your heart… perhaps you are even lost to it." Pitch tilted his head a bit. "And why are you so adamant of knowing more of me?" The Queen bit her lip a bit, glancing up at him with a bit of luster in her eyes. "Well… I ardently believe… that you and I would prove to be a good-"
Pitch hissed lightly then as something emerged from inside, interrupting the Queen's statement. He calmed when he noticed that it was just one of the puppet children staring at them from several feet away. The Queen glanced at it out of the corners of her eyes for a bit, gritting her teeth impatiently. "It seems like someone would like to join us." Pitch commented. "Dismiss yourself at once, you useless little brat!" The Queen snapped at the puppet child. The puppet child floated in the same spot eerily for a few moments longer, staring at them with its empty spaces for eyes before silently floating back, descending into the hole in the ground floor. Pitch raised a brow, stretching his neck out a bit. "Well, it's been lovely spending time with you, but I'm going to retire for the remainder of the night." He said, turning his back on the Queen and descending himself without uttering another word. The Queen watched him silently as Pitch left her, grimacing a bit to herself as she cursed under her breath. She glanced up at the moon once, sneering at it as it seemed to mock her. "I can see why he has an aversion to you…" She growled lowly before returning into the darkness of Houndsditch. Bumby glanced up as the puppet child from earlier returned, joining the others as he smirked lightly. "You've done well." He said before looking back up to the low light coming through the hole in the cavern ceiling. "The Queen is a spiteful and ambitious creature." Bumby said more to himself than the puppet children who floated silently in the shadows. "Whatever her intentions for Pitch may be, whether it is for personal gain or otherwise, I will not allow any possible risk upon my part arise due to those intentions." He stood, adjusting his glasses a bit. "Just remember… the others may be a part of this unit, but you are to obey me unless I state otherwise." He said to the puppet children, none of which gave any indication of a response. Bumby did not expect one; he needed none to know that they understood him, for their souls were a part of him now. The following morning, Pitch rose to his feet and strode out of his resting area, a bit irked by the persistent noise echoing throughout the cavern. When he came to the edge of the platform, he blinked when he came upon the sight of Elsa waving her hands about, reforming the ice structures that had been destroyed during the last battle. Wick floated around overhead, laughing as he used his flames to melt the ice debris into water so Elsa could collect it, reforming it into stronger pillars and coating the cavern walls to make a more protective barrier. They were about finished, still engaged in merriment when Pitch clearing his throat broke the lightness of the mood. Elsa stopped, her smile fading as she turned to face him, standing up straight and inhaling sharply. Wick descended so his feet touched the ground, though his smile remained. "Hi, brother Pitch!" He beamed. "We're fixing everything and making it new again. Are we doing a good job?" Pitch stared at Wick oddly for a moment, before turning his attentions to Elsa. "Well, someone has learned something from last night, and has decided to make herself useful." Elsa's expression hardened as she stared at him, narrowing her eyes a bit. "Well, I suppose practice makes perfect… that is what you want me to do, after all, use my powers?" "What good are they if they aren't used?" Pitch asked, glancing around at her work a bit. On the inside, he was impressed of how much she could do in such a short amount of time. Nearly all of the destruction from the fight had been swept away, remade into stronger structures. Elsa continued to stare at him a few moments, and Pitch did not expect the next thing she said to him to be so bold. "You know my fears, Pitch. But when you were struck with your own power, I saw a flicker of fear in your own eyes. I'm curious to know what the King of Nightmares has to fear." Wick's smile faded when he sensed the tension between Elsa and Pitch, and if it had not caught him off guard, Pitch would be enraged towards anyone who even dared to ask him such a question, to show such defiance. "Unlike you, Elsa, I have no fears." Pitch replied as he glared at her. "Now, you will refrain from asking any more questions; we have much work to do. You can go back to playing your little games with pumpkin boy later." He whisked himself away, Elsa sighing lightly as she glanced back at Wick apologetically. She then reluctantly followed Pitch, knowing more harshness was to come. They both stopped at one of the larger platforms, Pitch ushering Elsa closer to the cavern wall. "Wouldn't want her highness to run away again… it's what you're accustomed to, after all." "Please just begin." Elsa said with an exasperated sigh. Pitch gave a nod, closing his eyes for a moment as he conjured about a half a dozen nightmares. They snorted and scraped their hooves menacingly, all bearing their eyes into Elsa's. She stood poised, raising her hands as her eyes darted between them. They all burst with speed towards her at once, Elsa gritting her teeth as she shot bursts of ice at all of them. When the first group was frozen, she swiped her hand through the air as a second was conjured, chunks of ice and black sand flying in all directions. She barely had a chance to recover when a dozen more nightmares charged towards her, barely able to freeze them all. She whisked her hand, blasting some back. She froze one, waving her hand to send it hurling towards the others. Pitch observed in silence; indeed, Elsa was becoming more proficient in using her powers as a mode of combat, but he could still smell fear on her. He conjured another dozen nightmares to send charging at Elsa as she barely finished off the second wave. She froze about three or four of them, but when one came at her from the side, she whirled around to send an ice spike at it, blasting it back. She then whipped her head back to look forward, holding her hands up to shield herself. She took a step back, tripping and falling over a small rise on the platform. She scrambled to get to her feet, her heart pounding as she went to attack, but it was too late. The nightmare ran straight into her, bursting into black sand as another painful memory surfaced in Elsa's mind. She fell to her knees, gripping her head as she winced. 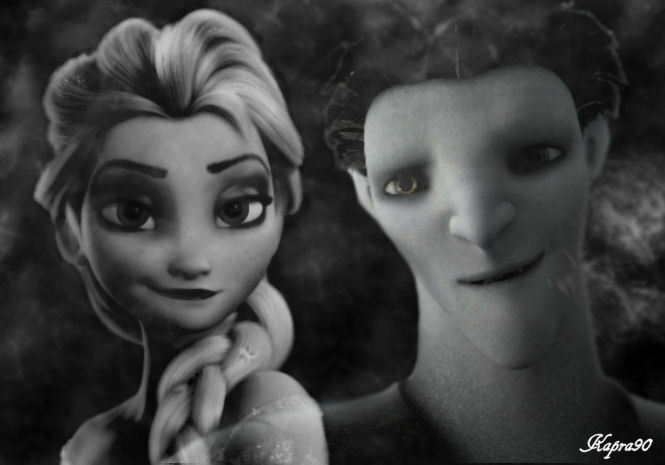 Pitch waved his hand to dismiss the remaining nightmares, so only he and Elsa remained. "You've failed again, Elsa." Pitch stated matter-of-factly. Elsa gasped for air as she tried to fight off the memory, shaking her head. "Pitch, I'm doing the best I can…"
"Well, then you have very little to offer if that is your best. But I know that isn't your best, Elsa. Do you know why I am so disappointed in you? You have the potential, you simply hold yourself back from achieving it." Pitch responded. Elsa looked up at Pitch from where she had fallen to a heap on the ground, exhaling audibly. "I don't know what else I can do to make the fear go away, Pitch… I've tried everything!" "Everything? How about this… realize that the only one stopping you, is you… not your enemies, your subjects, your responsibilities and obligations, not even your dear sister… just, you." Pitch said to her as he paced around her slowly in a circle. "So until you overcome yourself, and the limitations you place upon yourself… you're going to remain in this hole you've dug. Stop dragging yourself down!" He exclaimed. "Take some time to reflect upon what I've told you… and when you are truly ready… then perhaps we'll try again." As Pitch strode away from her, Elsa stumbled a bit as she picked herself off the ground, hugging herself as she gracefully descended a flight of ice stairs, heading towards some of the lower levels of the cavern. She seated herself on a flat rock, glancing around as she drew her knees to her chest. She sighed, closing her eyes as she shook her head. As she took this moment to attempt some form of self-reflection, she did not notice someone emerge from the shadows behind her until they spoke. "Struggling with painful memories again, Elsa?" Bumby asked as he approached the ice queen, who quickly lifted her head and looked over her shoulder. "No need to be alarmed, your highness. I've come to offer you some assistance, if I can." Elsa slowly turned to look forward again, her back once more completely facing Bumby. "I'm beginning to think I'm in over my head…" She replied. "That isn't the case, Elsa… I have seen some of your work; I believe you have more than enough ability to hold your own against us, our foes." Bumby said, and Elsa glanced over in surprise when he took a seat right beside her. "Your fear weakens you." "I know that…" Elsa whined, holding her head in her hands. "But it doesn't matter what I do… it just won't disappear from me…"
"Because you aren't cutting to its source. You must destroy its origin, Elsa, and the origin lies in your memories. I'm going to tell you the same thing I told the beloved children left to my care… all lost, all containing their own fears from the hatred and cruelty in the world, much like yourself." When Elsa glanced up at him intently, he leaned forward a bit. "Forget them, Elsa. Painful memories are unproductive." "How…? How can I just forget all those I have endangered? All that I've suffered?" Elsa furrowed her brows deeply. "Because it is all over, Elsa, it is all in the past. If you continue to dwell in it, relive it, you shall never move forward. Forsake those memories." Bumby said. "But… there's just so much…" Elsa sighed. "Ah, yes... you do have many ill memories; it is why so many of his nightmares are attracted to you. One person can only take so much. Your cup is overflowing, you must empty it. Reject those ill memories and you shall subsequently eliminate your fear. Only then will his nightmares be repelled by you." Bumby said. "Even if I did… would it truly bring me happiness?" Elsa asked. "Those who seek power must no longer feel happiness or sadness, only satisfaction and disappointment. Reward those who increase your satisfaction, punish those who disappoint you." Bumby answered. "That would be a big change to make." Elsa blinked at him. "Change is a good thing, Elsa… it is the first step in the chain of forgetting. Reaching the point of forgetting will release those chains from you, allow you to be free." Bumby said. Free. Elsa always wanted to know what it felt to be truly free. "I love my sister more than anything… all my life I was so afraid to hurt her, I tried everything to protect her from myself and I failed. Maybe… maybe this is what I need to do in order to save her… forget the pain… leave it all behind…"
"The cost of forgetting is high." Bumby said. "But the rewards are more than worth the cost." He extended his arm to place a gentle hand on her back, Elsa stiffening and glancing at him uncomfortably. "Hush now. I'm a doctor after all, am I not to be trusted?" Wick listened silently as he eavesdropped on Elsa and Bumby, bowing his head sadly. He shuffled away into his own dark corner, plopping down to look at his hands, his fingers like twigs. He curled them into fists, closing his hollow eyes as he exhaled sharply. "I won't forget. I won't forget what they did to me." He whispered to himself. "They did it to me because I was different. Because I liked to scare the children, like brother Pitch. The guardians took my life from me… I won't ever let them do that again. To me, or brother Pitch, or sister Elsa…" He opened his eyes, his expression filled with dark determination. "They are the ones who will be scared." He said lowly, igniting in flames as he dwelled on his anger. Bunnymund stretched his arms as he walked down the hall, stopping when he noticed Alice slowly and carefully sharpening her vorpal blade. When he made sure she had not yet detected his presence, he casually leaned against the wall, one foot resting flat against it, as he watched her. Alice's back faced him, and Bunny took a few moments to think to himself. In these past few days, he began to see a softer side to Alice, a side that was rarely shown but he found to be greatly appreciated. When she smiled, genuinely smiled, there was a particular beauty about her, lightness to her. Bunny knew very little of humans other than the children he protected, he had neither need nor time typically to learn. One thing he secretly envied of Jack is that he even had human experiences at all; what it felt like to not have the responsibility of the world on his shoulders, each year like a repetitive drone of producing, delivering, only to start again once it was all said and done. But with Alice, each day was a new adventure for her, a new door to open and discover what miracles or monstrosities lay beyond. She was fierce, and strong, much like himself, but there was an instability that dared to rock her when she reached that point. Like knocking out one of the legs of a table, she risked the fall back into the abyss, the chaos, the madness. Despite how hard she fought for her independence, her leadership, her maintenance of strength and resolve, Bunny realized that despite these qualities she mustered to upkeep, that she needed someone to remain by her side, to protect her in those rare moments of weakness or misfortune. "Are you going to tell me what you desire or are you going to just stare at my back side all day?" When Alice posed her question, not having even turned towards him an inch, Bunnymund jumped a bit, having been caught completely off guard. How long had she known he was there? He thought he had been so quiet… oh, Alice was certainly something, always quick to keep her tongue as sharp as her blade. "Oh, uh…" He cleared his throat. "Didn't want to interrupt you… accidentally cutting yourself with that, uh… wouldn't be pretty." Alice turned, raising a brow before she got up, approaching him. She tilted her head thoughtfully then. "Might I take a gander at one of your boomerangs?" Bunny blinked, not expecting her to ask that question. He slowly produced one, placing it into her hands. Alice ran her fingertips over it, nodding to herself as she flipped it over a few times. "These are certainly effective, but they could be even more so." She stated. "I have an idea in mind, but I'm afraid I lack the skills necessary to bring it to fruition." She glanced up at him. "Mind if I borrow them for a short while?" "Uh… what did you want to do with these, again?" Bunny asked, scratching behind one of his ears. "I'll explain when I fetch Hiccup. He should be able to get the job done." Alice answered, taking his boomerangs as Bunny followed her down the stairs. Meanwhile, Hiccup was in deep focus, biting his lip a bit as exhaled sharply. On the opposite wall, several targets were hung, and many arrows had been embedded in the wall around them, not one having hit a bull's eye yet. Merida floated near him, pursing a lip. "Hm…" She observed his form, floating up to him. "Straighten your back, lad. Puff out your chest a bit more." She floated behind him, squinting one eye for a moment before placing her arm under his, gently lifting it. "Aye, that's better. Now, keep a firm grip, and… loose." Hiccup shot the arrow, and it actually embedded itself onto the target that time instead of the wall, but still nowhere near the bull's eye. Hiccup groaned, letting out a defeated sigh. "I'm hopeless." He said with exasperation. "Oh, stop your pouting! You've only just begun, y' can't possibly give up now!" Merida exclaimed. "Not making me look like a very good instructor." "Yeah well, I can make anyone not look like a great instructor…" Hiccup shrugged. "Alright, let's try this." Merida yanked an arrow out of the wall, bringing it over to Hiccup. "Knock the arrow." "Merida, I'm just going to miss again-" Hiccup started to say. "Lad, as princess of Dun' Broch I order you to knock the arrow." Merida teased. Hiccup rolled his eyes, doing what she asked. He pulled back the draw string, and he stiffened a bit when he suddenly felt Merida right beside him, her hand placed over his on the bow and her other hand placed over his on the draw string, supporting his form. "Uh… hey…" Hiccup chuckled nervously. "Just do what I do." Merida said, complete focus in the features of her face. For some reason, Hiccup wondered in this moment what Merida looked like before she became a banshee… what was the real color of her eyes? Was her hair really as red as dragon's flame? He tried to push these thoughts out of his mind, instead focusing with her on the target ahead. A few moments passed, and they released the arrow together. When it embedded in the bull's eye, Merida smiled triumphantly. "You see?" She glanced up at him, still lingering close to him. "I knew y' could do it." Hiccup gulped, smiling crookedly. "Well, uh… it was really you helping me, but…"
"Excuse me, Hiccup?" Alice called out then, walking into the room with Bunnymund close behind her. "Might I bother you for a moment?" Merida exhaled sharply as she floated back a bit, allowing Hiccup to place the bow aside, clearing his throat as he did so. "Sure, what is it Alice?" He asked. "You have far better weapon forging skills than I do, so I have a favor to ask." Alice started, handing him Bunnymund's boomerangs. "Is there a way you can incorporate retractable blades?" "Woah, woah, woah! Those are very dear to me, I don't want anything to mess them up!" Bunnymund exclaimed. "They aren't going to be 'messed up," Bunny… they're receiving an upgrade. We'll need all the help we can get when we're combating with those filthy curs." Alice said, returning her focus to Hiccup. "Can it be done?" Hiccup looked the boomerangs over, tilting his head from side to side for a moment. "I think I'll be able to work something out with a few tweaks… give me by tomorrow, I should have something for you." "Well they'd better not have a scratch on 'em mate, or I'll have something for YOU." Bunny warned Hiccup, before walking off. Alice rolled her eyes, leaning in a bit towards Hiccup. "I'll thank you for him, since he obviously has no manners. You and Merida may carry on. From the looks of it, you have much to learn before you are adept in archery." She chuckled to herself lightly as she headed back up the stairs, doing a double take when she noticed Eliza staring up towards Jack's loft. Alice slowly approached her, gently placing a hand on her shoulder. "Eliza? Is everything alright?" The girl glanced over at Alice, smiling lightly and nodding. "I think Jack is drawing pictures on the windows." "Well then, why don't you take a closer look?" Alice asked. "I'm still a little nervous." Eliza said, hugging herself a bit. "What if I joined you?" Alice asked. "Come, let's go see what he's making." She guided Eliza up to the loft, Eliza side hugging Alice once they had both reached it. Jack turned when he heard them coming up, smiling lightly. "Hey… nice to see you again, Eliza." He smiled. "Do you want to help me draw on the window?" Eliza smiled nervously, glancing up at Alice. "I'm right here." Alice said. "Remember what I told you. You can always trust Jack." The girl nodded, slowly inching towards the window, still hugging herself. Jack bent down to her level to try to make himself seem less intimidating. "So, what's your favorite animal, Eliza?" He asked. Eliza pursed her lips in thought, a bit of hair falling into her face. "Deer." She answered quietly, biting her lip. "I don't remember why though…"
"That's okay… so we're going to play a little game, okay? I'm going to make some ice on the window… and then you are going to draw a deer for me. Can you do that?" Jack asked. Eliza glanced around uncomfortably, whining a bit. "But… I don't want to see the ice… there's a scary snowman monster downstairs…"
"Well, he's a little weird, but, that wasn't from me. I promise, nothing's going to hurt you. I showed you how fun it can be, remember?" Jack said. Eliza nodded a bit, glancing up at him. "I keep remembering the lake monster… it… swallowed somebody up, and the person disappeared… I never saw them again…"
"There's no lake monsters in here. Now… I'm going to hold my hand up, and you tell me when I can put ice on the window, okay?" Jack asked. Eliza whimpered lightly, closing her eyes tight. When she felt Alice side hug her lightly, her trembling stopped, glancing over at the young woman's gentle smile. Eliza calmed a bit, slowly glancing up at Jack. "O- Okay… you can do it." Jack gave a nod, icing over the window. Alice took Eliza's hand, walking her over towards it. "We can draw together if you like, so you can see how I fare." Alice suggested. "Okay." Eliza said quietly, and Jack beamed when Eliza joined Alice in cautiously drawing on the window. A smile slowly grew on the child's face, pointing at the window when they finished. "It looks like the deer and the bunny are outside!" "Indeed, it does." Alice smiled lightly. "See? Jack just wants to be your friend is all, love." Eliza looked up at Jack, smiling lightly. "Maybe… maybe if Alice is your friend, I can be too." She inhaled sharply then, her hand shakily extending a bit. Jack looked at the hand in surprise. "You want to shake my hand?" He asked. When the girl nodded, he carefully took her hand, shaking it lightly. Eliza looked at her hand, observing the top and her palm, the child surprised that Jack had left no frost behind. She then turned to Alice. "Alice, may I get something to eat?" Eliza asked. "Of course. Remember to ask politely." Alice nodded, and the girl headed out of the room. Jack smiled contently, sitting down on his bed. He pat the spot next to him for Alice to sit, which she did. "She's a sweet kid." Jack said. "Indeed… I'm glad that she's beginning to trust you." Alice replied. "Because she knows you trust me." Jack said. "You know Alice… in a way… you're like a guardian too." Alice exhaled sharply, smiling for a moment before shaking her head. "No, it's something that I can only dream to be. I… I can't protect children. I've failed to in the past, and…"
Jack frowned. "Alice, we're not perfect. You… look at how much you take care of Eliza. It all starts in here." He held a hand over his heart. He glanced over at the window for a moment, chuckling lightly. "You know… Eliza kind of reminds me of my sister in a way." Alice tensed up at that statement, her breath caught in her throat. "O- Oh…" She squeaked out. "In what manner, may I ask?" "Well… it's when she smiles. And her eyes, they're big like my sister's was. Maybe that's why I'm so happy that she's finally starting to trust me, not just that she's believing in me, but it's almost like I have Emma right here with me." Jack described. Alice kept her head hung a bit, glancing at Jack out of the corners of her eyes. "She… comforts me too… it's why I named her Eliza. She had forgotten her name when I came to Houndsditch… it felt nice to… to have a sister again." "Speaking of which… did you happen to find anything about her when we were poking around there that one night? I mean… I wanted to see if there was anything about her, but we were kind of on a time limit, and-"
"No. No… there is nothing there about her." Alice said, her hands folded anxiously in her lap. Jack glanced over at her, frowning lightly. "Hey… you okay?" He asked. Alice sighed, glancing over at him. "I… I know that you… have nightmares of her… I have nightmares of my sister too…" She started, trying to gather her thoughts. "Jack… I need to ask you a question of… hypothetical nature…"
Jack turned so he was facing Alice. "Sure… are you sure everything is okay?" Alice bit her lip for a moment. "Jack… if… if it turned out that… Eliza meant a lot more to you than you knew… if… for example, if she was-"
"Jack, Alice!" Eliza ran into the room, taking each of their hands into hers. "Toothiana said to fetch you, she, North and Sandy have something to show us all!" Alice let out a deep breath, closing her eyes for a moment before looking to the girl and nodding. "Very well, Jack and I will come down." She followed behind Jack and Eliza as they joined everyone else already gathered around the large feasting table. North, Sandy and Tooth were scanning the words of their sacred book carefully, glancing up when Jack arrived. "Hey, what's going on?" Jack asked. "I think we may have found the answer Alice was looking for…" Tooth answered, but they did not look pleased in the slightest. They allowed Jack and Alice room to hover around the book, Sandy waving his hand over the paragraph. 'Though dolls bring joy to children, and have done so for many ages, they, as well as similar objects, like puppets and marionettes, are a constant reminder to guardians of the ill fate a child may encounter if they are unable to be protected, or if their child's mind eye is closed prematurely or blinded.' Alice read. 'If their minds, hearts and/or souls are taken from them or controlled by an evil or malicious entity, they will become something akin to any of the things listed above, and they will lose the ability to have free will and to believe in the guardians that bring them joy and happiness. They will only be able to see what the evil and malicious entity makes them see, and will follow in their footsteps down a path of darkness.' Alice glanced up at the guardians. "This was notated in the book centuries ago when we first began to fight Pitch and his forces. The dream pirates that he allied himself with used to be able to turn children into fearlings, and after the great battle, only Pitch and his nightmares remained, his power greatly diminished compared to what it had been." North said. "So you are suggesting, then…" Alice started. "… that Bumby has collected their souls? That is how he turned the children?" "It's the most probable explanation… when you spoke of him manifesting as the… 'doll maker,' as you called him, in your wonderland… I remembered this passage, and I had to read it over again." Tooth said. Alice shut her eyes tightly for a few moments, exhaling slowly before opening them again. "Well… that answers that question then." "What're you talking about? What question?" Bunny asked, his nose twitching a bit as he scanned the words himself. "The question of how to restore those children. The only way it can be done… is if Bumby is destroyed completely." Alice glanced around at all the adults in the room, her eyes resting on Anna and Kristoff. "And anyone who attends to him." Anna stood at that, shaking her head. "No! Do whatever you need to do, but you need to spare Elsa, please!" "Alice, Elsa is just as much of a victim in all of this as those children are. You don't know how badly Pitch is playing with her head… or even Bumby, for all we know, they both may be twisting her thoughts." Jack said. "True. But my first priority is those children. Anyone who stops me from ensuring their well-being will fall by my hand." Alice replied. "It would be in Elsa's best interest if she avoids trifling with me." Hiccup came into the room then, walking up to Bunnymund. "Special delivery, not a scratch on them, as promised." Bunny raised a brow, taking his boomerangs into his hand. "Mate, that took about two hours." "Just be careful… here. You push that with your thumb to unsheathe the blades, then down and back to retract them." Hiccup said. Bunnymund tried them out, nodding his head a bit as a smile grew in his features. "This is wicked, Hiccup." He pat the Viking's back once. "Just in time for some more fighting, huh?" "Indeed." Alice said, glancing at everyone. "We must prepare for the next confrontation… they aren't going to come out of their hiding place until they have reason to, so we will have to bring them everything we've got and give it our all." Merida gave a firm nod; she would not fail against Bumby this time, she would find a way to battle him more effectively, failing to do so was not an option. Elsa sat in deep thought, her eyes closed. When she felt something against her face, she opened her eyes and jumped a bit in surprise when Wick's face was about an inch from hers, and he tilted his head. "I scared you." He smiled. "Wick, you should have at least warned me first…" Elsa sighed lightly, getting up to pace around a bit. "But I like scaring others. It tickles the straw under my hat." He giggled. She turned, smiling lightly. "Sometimes it isn't nice." She took a step closer before speaking again. "Wick, I need your help to use my abilities better." Wick perked up at that, smiling and nodding. "So brother Pitch will be happy, right?" "Well, yes… and so I can overcome my fears." Elsa replied. "I want to try to… clear my mind when I use my powers. I was thinking of trying out my-"
"Wick!" A voice hissed, and the Queen came into view. "I request your presence immediately; you have much work that's needed to be done. Not time for procrastination, our foes could return any day now." Elsa turned, frowning as Wick's smile faded, cowering a bit. When he wasn't moving fast enough for the Queen, she growled, using one of her tentacles to knock him down, making him whimper. "I- I'm sorry, I-" Wick pleaded. "You are an insignificant, pitiful waste of space!" The Queen snarled. "You are incompetent to fulfill even the simplest of tasks and I must be the one who has to endure your ineptness!" The Queen reared her hand back to strike down upon Wick, stopping halfway when Elsa stood between them. The Queen smirked darkly, licking her lips. "Leave him alone." Elsa said lowly. "Dare to defy me again, you headstrong girl? It's a good thing that Pitch has taken some shred of liking to you otherwise I'd have devoured you ages ago!" The Queen snapped. "He's not going to learn anything with you treating him like this, so I'm going to help him in his fighting. We work better as a team than you." Elsa replied. The Queen's eyes widened, her fist clenching. "You dare to speak to me in such a manner? Have you not yet learned your place among us? YOU are the underling, and I am your superior!" "I am your equal!" Elsa shouted. Their bickering earning the silent, undetected attention of Pitch and Bumby both. "I am a queen just as you are, whether you choose to accept it or not!" The Queen's temper reached its limit, lunging forward at Elsa. She scrambled back, grabbing Wick's hand as he trembled with fear. "I will murder you in cold blood!" The Queen screeched. "Wick, get out of here!" Elsa cried as Wick speedily hid behind a large rock, peeking out from behind it and whimpered in fear for his friend. Before Elsa even got a chance to ready herself, she grunted as one if the Queen's tentacles slammed into her side, knocking her down harshly. She shot a burst of ice from her hand, spikes rising from the ground to buy enough time to get to her feet. The Queen simply rampaged through them, knocking them down as she screeched angrily. Elsa's heart pounded in her chest, breathing rapidly as she felt herself, once again, with her back against the wall. The Queen planted her large hands on the cavern wall on either side of Elsa, leaning in dangerously close as she bore her sharp teeth. "Oh… how I will enjoy every moment of devouring your ivory flesh… every drop of blood that spills from you will only add to my satisfaction!" The Queen said menacingly. As the Queen opened her mouth wide, Elsa shut her eyes tightly, her fear at its maximum. As she let out a shaky breath, Bumby's words echoed in her mind, and in the darkness behind her eyelids, she saw a snowflake moving back and forth slowly, before turning into a familiar clock in one of the halls of the castle, the pendulum piece swaying to and fro hypnotically. It began to swing faster the more Bumby's words echoed, the glass finally cracking as the pendulum piece slammed against it. The cracks formed into a jagged snowflake, a high pitched sound of the clock tolling screaming in her ears causing Elsa to snap. Her eyes burst open, and the young woman screamed as she lunged at the Queen, her palms shoving against her face as she covered it with frost. The Queen reeled back, wiping at her face as she hissed, but Elsa grit her teeth, her eyes glaring with rage at the Queen as the only thing that existed in her mind was to fight off the monstrosity before her. She stormed towards her, forcefully swiping her hands through the air as she sent one ice blast after another, blasting the Queen back until she was then the one against the wall. Elsa thrust both her hands forward, sending ice shards from her hand to pin the Queen's tentacles to the wall, one by one. "How does it feel to be cornered?! How does it feel to be helpless?!" Elsa screamed, pinning the Queen's hands with larger spikes, the creature's screeching increasing in volume and intensity. "Now who is the one crying out in pain, with fear?!" Pitch watched on in absolute shock. He looked at his hands, then quickly at his nightmares. He had commanded them to stand between Elsa and the Queen, to deter the young woman from turning the Queen into a raw calamari delicacy. But the hooves of his nightmares stood firm. They sensed no fear emanating from her now. Elsa broke off a thick icicle from the cavern wall with her bare hand, rearing her hand back as she was about to impale the Queen's face with it. Pitch's eyes widened, speedily flying towards her as he stopped behind Elsa, holding her hand back before she could complete the action. Elsa screamed on the top of her lungs, her eyes crazed as Pitch dragged her back, his expression still full of shock in Elsa's sudden and drastic change in behavior. Bumby however, remained silent yet observant, smirking lightly as the scene of the bloody, shrieking Queen reflected in his glasses. The seed of influence had been planted… oh yes, now they were getting somewhere. Elsa struggled against Pitch, thrashing as he continued to drag her backwards. When he thought nothing was going to tame the suddenly reckless woman, Wick ran out to stand in front of her. "Elsa!" He cried, holding his hands out to her. At the sound of Wick calling her name, her eyes darted to him, her movements slowly ceasing as she finally began to calm down. She took steadier breaths, the rage leaving her eyes as she stared at him. Pitch glanced between the two of them, letting go of Elsa's hands and taking a step back to allow the young woman to look at the icicle in her hand, dropping it so it shattered, before looking at her hands for several moments. She looked up at the Queen then before glancing over at Wick, shaking her head. "What… what did I just… do…?" Elsa breathed. Pitch watched Elsa for a moment before speaking. "You broke through your fear." He slowly panned around her so he stood before her, staring into her eyes. He glanced back at the Queen momentarily, unsympathetically, before looking at Elsa. "Now… I believe you are ready to bring down Jack Frost." Elsa stared at Pitch for a moment, her hands dropping to her sides as Wick floated over to stand beside her. "What… I don't understand-"
"Your fear had completely disappeared, Elsa!" Pitch grinned, holding his hands out. "This is the breakthrough I have been waiting for!" "But Pitch… I completely lost my composure… it wasn't right…" Elsa shook her head. "So you're telling me it wasn't right to put her in her place?" Pitch nodded his head towards the Queen as she fell to the ground in a heap after unpinning herself from the wall, hissing lowly at them before diminishing into the shadows. "That it wasn't right to stand up for yourself?" Pitch asked. "You have finally proven to me that you can hold your own… that you are truly committed to fighting for the same thing all of us are fighting for… to be believed in. To not be cast aside as nothing more than a… a monster… to bring down those who choose to keep us locked away while they bask in all their so-called glory." Elsa looked up at Pitch as Wick glanced between the two of them, tapping his scythe on the ground a couple times, chuckling darkly and illuminating. "I want to be believed in too, brother Pitch." Pitch glanced at Wick, exhaling sharply. The pumpkin themed creature annoyed him quite a bit, but he forced a smile. "Oh, yes… I should say the same for you, Wick." Wick's smile brightened a bit, floating over and hugging Pitch without warning. "This is going to be great!" "Oh, will you- stop hugging- you're going to mess up my robes, you-!" Pitch sputtered, and Elsa couldn't help but laugh at the scene. The tension in the air seemed to disappear, and despite the small amount of struggle he was enduring, Pitch found himself drawn to her laughter. It was the first time he had heard the young woman laugh genuinely; in those moments of merriment she shares with Wick, he'd tuned it out for the sake of remaining serious, focused, to be an example for Elsa to look to as she assimilated into their collective. But now, oh, how she'd gotten his attention with her fierce attack against the Queen. And now that his attention had been collected, he was intrigued by the sound of her laughter; from what he knew of her, it was quite a foreign sound… so why was he so drawn to it? He straightened himself out once Wick finally let go of him, clearing his throat. "Well then, I think you deserve a bit of a treat… you can spend the rest of the afternoon frolicking with Wick here… draw some inspiration off of each other. But tonight…" His expression became serious once more. "We must make preparations. Our enemies could come back any day now to reattempt their retaliation." Elsa sighed lightly, smiling gently as she looked up at Pitch. "Pitch…" Elsa started, taking a step closer. "Look… I… I know we've… we've had our differences since we've been here but… now I see that… maybe in order for the world to believe in us… maybe we need to believe in each other. Like the doctor said… I just need to forget the pain… the suffering… and replace it with something more productive. You brought me here because my sister asked for your help… and I'm going to do what I can to bring us all success." Pitch blinked at her words, furrowing a curious brow at the mention of Bumby. He quickly scanned the area for the doctor, but he had concealed himself well in the shadows; for now. "Well… I may have been a bit harsh on you. But… you see… it seems to have paid off. Now we can see eye to eye from now on, hm?" Pitch smirked. "Run along now, the afternoon is wasting away." "Let's go finish your ice building, Elsa!" Wick exclaimed, taking the young woman's hand and practically dragging her with him. Pitch watched the two go along their way, his eyes darting to the side when he sensed a presence silently nearing him. "So…" The voice spoke, and Pitch turned to face Bumby as he emerged from the shadows. "That was quite a spectacle, was it not?" "It certainly was… it seems that the Queen has met her match… and that her ego has shrunk quite a bit… as she has into the shadows, apparently." Pitch replied. Bumby chuckled lightly. "Let me ask you something, Pitch… have you been around many women in your many years of life?" The Nightmare King shrugged. "Can't say if I have or haven't… living for many centuries takes some time to recall." "Ah… you see, women, regardless in how successful they are in displaying their strengths, exist for one purpose. They exist for pleasing men and providing a means for procreation. Women fight each other and use the excuse of disagreement or hostility to cover up the subconscious motive of our attraction… you see, I love the ones who fight, who reject me… because deep inside, they know that it will only beckon me to them more, like a wolf giving chase to its prey. Beautiful women know they are beautiful, they need not verbalize it. Women who aren't do so that they may try to convince themselves more than others. The Queen envies that of Elsa." Bumby rambled. "But that isn't what we're here for, is it, doctor?" Pitch asked. "We can't afford distractions." "Distractions are always warranted… and if you can afford to make a living of it, even better." Bumby leaned in a bit, smirking. "Don't worry, Pitch… you'll find that my… assistance to the young queen will come to aid us in the future. Women are so very gullible. Even scornful ones like the Queen are so easily manipulated. Come now Pitch, don't keep your mind so refined. You're the King of Nightmares after all… you are familiar with corruption, no one can judge your thoughts." Pitch glanced at Bumby warily as he floated off, raising a brow. The doctor was certainly an excessively dark force, and the more he learned of him, the more twisted he seemed. In the meantime, the Queen descended away from the others, screeching angrily on the top of her lungs. "Curse her, curse her! Oh, how I loathe her equally as much as that wretched Alice! They think she is the key to our victory? I will show all of them… while they simply wait for those insolent fools to arrive here at our doorstep, I shall seek out their intentions myself and engage in a more useful employment!" She hissed as she gathered herself, crawling up the cavern wall to begin her journey to the tundra. Alice gently closed Eliza's door, having just tucked her into bed. She stopped when she approached Jack's loft, peeking up to see if he was asleep yet. She smiled lightly when she saw he was still awake, approaching him. "Hey…" Jack smiled as Alice sat beside him. "You should get some rest, we've got a big day tomorrow." "I shall soon enough." Alice smiled lightly. "I just… Jack, when… when no one was able to see you… when no one believed in you… how did you endure? How did you endure, not knowing your true purpose in life?" Jack frowned a bit, glancing out the window out the moon. "Well… that's all I did for a while. Endure. I asked why, only to get silence as my answer. But once it all came to me, I realized that all those times that I got no answer, it was because it wasn't my time yet." "Well… I suppose I don't have three hundred years to wait." Alice sighed. When she felt a gentle hand on her back, she snapped her head up at Jack, glancing at him in surprise. "You're probably not used to… someone comforting you, Alice." Jack smiled lightly. "Believe me, I wasn't either for a while. So many people around, but none of them knew me. Alice… whatever answer is out there, it will come to you. And… I want to be there for you when it does." The young woman smiled, nodding in thanks to him. "I would very much like that." Jack retracted his hand, folding them in his lap as they sat next to each other in silence for a few moments. "So, um… there was something you were trying to tell me earlier… what was it?" Dread hit Alice like a ton of bricks again. She stood, pacing around the small loft. "Well…" She inhaled sharply. "I… you know how dearly I care for Eliza… like… like a sister." "Yeah… I love that kid." Jack smiled, but tilted his head when he noticed Alice's returning uneasiness. "Jack… I just want you to know, that… that…" She exhaled deeply, struggling to say the words. "Hey… Alice, whatever's wrong, you can tell me. We're friends, you can tell me anything." Jack encouraged. Alice closed her eyes tightly for a moment, her heart sinking into her stomach. Whether the words came out or not, there was so much at stake for her. She finally turned to face him, opening her eyes. "Jack… if something ever is to happen to me… if I meet some… premature end… I entrust Eliza to you. Keep her as you would your own sister." Jack was surprised by the statement, blinking a bit. "Alice… you-… nothing's going to happen to you. I'm going to make sure of that." "Jack, I'm human… my life is not guaranteed-"
"Alice, you are not going to die." Jack said firmly, standing to his feet, and to both their surprise, he took her hands in his. After a few moments, he let go of them, clearing his throat. "Look… whatever happens, I'm going to be there for you. All of us will." The young woman's heart skipped a beat, her breath caught in her throat for a moment before they smiled at each other Jack glancing to the side a bit shyly. "So… earlier, when you mentioned to all of us that you would attempt to reach out to Elsa… how do you plan on doing so if you aren't going to disclose that her sister is currently residing with us?" Alice asked. Jack blinked at the sudden change in subject, but decided not to question it. "Well… Pitch is obviously using her because of her powers… if I can make her see that he only cares about himself, at least give me a chance… I can give her what she really wants… and then she can help us bring Pitch down." "You make it sound very easy Jack… but didn't you say yourself that Pitch is extremely cunning?" Alice replied. "I have to try, Alice… if… if my sister was out there somewhere, I would be doing the same thing Elsa is doing. But she isn't going to get her sister back by hanging with that crowd. I have to get her on the right path. If I can let her know that I at least relate to her… then maybe she'll hear me out." Jack said. Alice's heart throbbed in her chest, feeling guilt as she glanced away from him. "I suppose… but don't be surprised if she spurns your attempt." As the two spoke a bit longer before saying goodnight, just outside Jack's window, despite it being closed, the Queen was able to hear every spoken- and unspoken- word in silence as a wicked grin spread across her features. She could read Alice's heart, and she was satisfied that she could use its words against her, against all of them, as well as the words exchanged between her and Jack. Undetected, she felt she had garnered enough to bring an unexpected, but most certainly appreciated, report back to Pitch once she returned. She slithered along the roof quietly, sniffing the air. She knew Elsa's scent; she knew the ways of the heart, blood, flesh, very well, as it was all that encompassed her form. When she captured a particular scent, her pupils shrunk, quickly but quietly following its trail. When she gazed into one of the windows, peering in to see a young woman fast asleep, her auburn hair strung about her face, her grin widened, stretching across her face. Oh no, she would not have her attentions pushed aside for Elsa after this… Elsa would be the one groveling for them, and the Queen slithered with anticipation through the night back to London. Pitch opened his eyes as he found himself deep in his subconscious once more, in the same situation as he had the past several times. He found this recurrence irksome, the same thing always playing out with the exception of a few minor details changing here and there. This would not be the case this time. As he gazed upon Elsa clinging to the pillow, gasping as the sound of the door breaking down behind her and Pitch causing her to run towards the window, breaking through it, glass once again shattering everywhere as her hair whirled around her, something changed. Everything slowed down once again, but when she turned in midair to steal one final glance at him, Pitch was surprised when her face had changed. It was no longer Elsa, but another woman… he was not familiar with who she was, but… why did it seem like he knew her somehow, as if she were in some distant, fleeting memory? Her eyes like sapphire stars in the sky bore into his, her one hand outstretched towards him before she made her descent. She uttered a single word, but as usual, it was muffled, inaudible. Pitch suddenly had the will to move, running over to the window and glancing down as the young woman made her descent. His eyes widened when she fell with the glass cascading around her like rain, into what looked like the smokestack of a train as its whistle emitted a hollow scream. Her body lay limp inside it, and wind blew through Pitch's hair. The train then began to move, taking the young woman with it who rested inside. Curiously, as the train seemed to go under the location of the window and out of his line of vision, he whirled around, dream pirates blocking the doorway. He shoved his way past them as they dissipated into black dust, the howling scream of the train heard in the distance as Pitch moved through the doorway of the room, into the hallway where another window was. When he gazed through it, he observed in bewilderment as he saw the train moving towards what looked like Arendelle in the distance. The muffled word sounded in his ears once more before the vivid dream ended, Pitch awakening in the darkness of the cavern to what he thought was himself, opening his eyes and sitting up. The Queen stepped into the low light, a knowing smirk stretched across the features of her face. "Good, you've awakened at last." Pitch scowled at her, getting to his feet and straightening himself up. "If you've come here to give me a sob story over Elsa, then I don't want to hear it." "Oh, what I have to say partially concerns the little wretch…" The Queen said darkly. "… however, not in the manner you currently perceive." An irritated sigh was drawn from Pitch's lips. "Very well, can you at least make it quick?" He asked, not taking the Queen seriously; most times, her words were nothing but ridiculous and nonsensical babble to him. The Queen chuckled lowly, taking a step closer. "You'll be surprised to know that I did a bit of eavesdropping tonight. You see… while you all remain idle, I am willing to take a step further in the matter of ensuring our enemies' demise… it seems our favorites have been keeping some secrets from us that I'd like to share with you." "Well, please, don't draw out the suspense; I'm aching to know everything you have to offer…" Pitch said sarcastically, rolling his eyes. "Fine… being you're being such a spoiled brat, I'll give you one piece of information, and to receive the other, you'll have to do something for me." The Queen said as she raised an arrogant brow. "I don't have to do anything you say, your highness." Pitch spat. "You can't even handle yourself against your so-called underling, so what makes you think you're a match for me?" Pitch asked. "Because I have the key to our upper hand in this war." The Queen replied. "So you'll either swallow your pride and give into me… or you will face humiliation and defeat once more by your greatest rival… Jack Frost." Pitch raised a lip in disgust at her as she licked hers hungrily, awaiting his answer. "Fine." He replied with such loathing, hoping that temporarily satisfying whatever sick desires she wanted fulfilled would get her off his back. "Now was that so difficult?" The Queen asked, chuckling darkly as she slithered around to stand behind him, Pitch grimacing as she ran one of her long fingers under his chin before placing her hands on his shoulders, her mouth nearly pressed against his ear as she spoke to him. "Your precious little Elsa… what is the one thing she wants more than anything?" "She wants to be seen as more than just a monster." Pitch replied. "No, you fool!" The Queen hissed, moving to stand in front of him once more. "Even deeper in her heart than that! It is her dear sister." "And? What about it? Until Elsa fully controls her abilities, rather than the other way around, no help can come from her… rather statuesque sister probably being marveled and mourned by the citizens of Arendelle." Pitch shrugged. The Queen grinned darkly, shaking her head. "My dear Pitch, many times since I have known you, you've been right. But this time… it is quite the opposite." Pitch furrowed a brow as he shook his head lightly. "In what matter? I'm not sure I quite understand-"
"The sister, what is her name?" The Queen asked. "Her name… is Anna." Pitch replied warily. "Freckled skin… auburn hair, a cherubic face even in slumber… sound familiar?" The Queen asked, raising her brows. Pitch stopped then, his eyes widening in surprise. "How… you have never… how could you possibly-"
"She is currently residing at the dwelling in the arctic." The Queen stated, straightening her spine. "Safe, sound, and not as statuesque as you had just previously described." Pitch exhaled sharply, taking a step back as he shook his head in disbelief. "How is this possible?" "That I do not know, Pitch… but I do know that they have a loose end opened wide… a faulty piece on their side of the chessboard. If Elsa is to know they are keeping her there… this would be our way in, our way to penetrate their fortress. But there is something else there, or rather; someone… that I feel would be more significant to you." The Queen said. "We would have to convince Elsa they are keeping the girl against her will if she was to find out of her sister's current location and state." Pitch replied. "And… who might that be?" "Remember what I told you earlier… if you want to know, you'll have to do something for me." The Queen replied coyly. Pitch groaned, gritting his teeth as he glanced at her irately. "What is it?" "Let me in." The Queen said, Pitch taking a step back as she moved forward. "Let me into your space… see into the deepest recesses of your heart…" The Queen inhaled sharply as she chuckled quietly, leaning in uncomfortably close for Pitch. "You have such an intriguing scent, such a mysterious form… just as your minions are drawn to fear, I am drawn to you in this manner." Pitch began to wonder if whatever information the Queen had to tell him was worth this; her face was now mere inches from the nape of his neck, her green and red swirled eyes staring into his with hungry lust, her lips quivered with anticipation. "Can you at least give me a hint before I make such an agreement?" Pitch asked, wishing that anyone, anything but her were so close to him in this moment. "I will disclose this much…" The Queen whispered, moving so she was standing at Pitch's side, leaning in close to whisper in his ear. "If we take this person… this person who I have seen kept secret, under lock and key within Alice's heart… both she and your greatest enemy will be brought down… it will be the key to completely destroying Jack Frost." Pitch glanced at the Queen out of the corners of his eyes, gritting his teeth a bit. "Very well… we can be… acquaintances…" Pitch had to use all of his willpower not to gag as he felt the Queen's hands wrap around his waist. "Oh, I could just devour you whole." She chuckled with amusement. "Now… there is another who slumbers safely and soundly, and Jack Frost doesn't even know who she truly is…"
"Who is it?" Pitch demanded. The Queen smirked. "A certain… Emma Bennett… now if I recall… was she not present when we-"
"So that's where she is…" Pitch breathed, shock initially in his features before the corner of his mouth broke into a wide smile, laughter rumbling from his chest until it swelled up, clenching his fists with anticipation. All the disgust towards the Queen he had been feeling had been replaced with eagerness. "And you said he is not even aware of it?" He laughed more. "Oh what fantastic news!" "Indeed, it is… it seems his little friend Alice is willfully keeping this information from him." The Queen said. "How could you possibly determine this?" Pitch asked with curiosity. "You read the fears of others, Pitch… I can read hearts… I can detect all sorts of information in the blood and flesh of an individual in one whiff of their scent… on one beat of their heart I can see an entire story." The Queen replied. "There is nothing that any may conceal from me." Pitch nodded slowly. "Divide and conquer…" He breathed. "But let's not be too hasty. We needn't use all our ammo at once. When the time is right, all will be revealed. For now, let's keep this trick up our sleeve." "As you wish." The Queen replied. "Now… we know that our enemies will soon be arriving… we should discuss how to properly execute their demise." She said, Pitch clearing his throat uncomfortably as she moved to seat herself a little closer than he would have liked.